I’ve recently been thinking of science fiction as literature of the moment, an examination of how we look at the world and all of the many changes that pass us by. Given the state of the world, military science fiction has long struck me as a way to make sense of the global impact of the ‘war on terror’ and other related actions across the world. Rugged individualism and a sense the edge of the world is an opportunity, no matter who’s already there. Predominantly, Military Science Fiction as a distinct subgenre comes out of works published in the 1950s by American science fiction authors, namely Robert Heinlein and Gordon R. Dickson, whose respective books Starship Troopers and Dorsai!, have spawned an entire industry of imitators. Steeped in the fears of the Cold War, these novels were written at a time when global annihilation appeared imminent, held back only by the raw power held by the United States Armed Forces and the inherent greatness of the American way. This lines up strongly with other trends one sees in American strains of Science Fiction: rugged individualism and a sense that the edge of the world is an opportunity, no matter who’s already there. Science fiction tends to carry along its baggage for a long time. While there’s been an incredible evolution of outstanding stories, the genre’s frequently saddled with a pulp characterization; the incredible changes from the so-called Golden Age to the New Wave and beyond simply doesn’t register. Military SF, in many ways, has a similar history: it remains, in many people’s minds, a relic of the 1950s, when the Cold War raged between the politicians and armies of the US and USSR. In retrospect, it’s appears to be a simpler conflict than what we face today. As fiction has changed with the times, so too has the conduct and execution of military actions. While the general perception of military science fiction hasn’t radically changed, it’s clear to me that the collective experiences of the war on terror will introduce a new range of voices into the genre. This isn’t a tacit approval of the actions of the US: merely an observation that such events have taken place, and with that, reactions from every quarter. Already, there have been some interesting, military themed genre novels that certainly were influenced by the technological, political and social changes that have taken place over the last decade. Myke Cole’s two novels, Control Point and Fortress Frontier, closely examine and use the workings of the modern US military. Cole’s a good person for this as a former contractor and current US Coast Guard reservist. Karl Schroeder’s short (free!) novel Crisis at Zephra keeps pace with the wide-spread adoption of counterinsurgency tactics and personal communications technology. Interestingly, the book wasn’t written for the general public, but for the Canadian Military as a futurist project. Adam Robert’s fantastic novel New Model Army looks beyond technology to how our tendencies to communicate and collaborate change the very face of war. The end result is akin to the Occupy movement with AK-47s. There’s still others, from authors such as Karen Traviss’s fantastic Republic Commando: Hard Contact to her Wess’har Wars series both of which address a number of military issues. The same can be said for Karin Lowachee, Jean Johnson, and many others, who have been bringing new and different viewpoints to military fiction. There’s more on the horizon, who’ve been watching the world and writing about it. As our military actions have changed, the Military SF genre as a whole is posed to change quite a bit. As our military actions have changed, the Military SF genre as a whole is posed to change quite a bit. It’s easy to stigmatize the existing genre as a politically conservative group of readers who can’t move on from the attitudes of the Cold War, and to an extent, that’s probably true for some readers. But other readers, myself included, have begun to look for other types of stories in the genre: ones that examine the nature of warfare, and question the motivations, politics and actions of the people behind it. The world has splintered into numerous factions since the polarization of the 1950s, and the genre is likely going to benefit from the complicated nature of a new style of warfare. I read and enjoy Military SF for that reason: it presents a range of situations that are literally life and death for its characters. When I studied for my Masters in Military History, I was struck at how the lessons from warfare could be applicable to the decision-making process of a CEO in charge of a business – learning quickly to determine, accurately understand and approach a problem. For soldiers and officers, this is a critical process, as their lives sometimes depend on the ability for this to happen quickly, and correctly. Military SF can be used for the same ends: examine major problems, placed into extreme situations. Already, we’re seeing very relevant elements such as electronic monitoring, drone warfare, robotics, the role of human soldiers and the ethics of conducting combat operations filtering their way into science fiction texts, and I hope that we’ll see more of this. The genre provides an interesting test bed for an entire range of concerns about warfare, up to and including the very act of an organized military taking the lives of their enemy combatants, and those caught in the crossfire. These are all concerns that I see when I turn on the news, and I suspect that we’ll see similar things for as long as we go to war. All of this has come to a head recently, when I began to work on a new anthology with Jaym Gates and Apex Publications. War Stories: New Military Science Fiction is an anthology that I want to challenge some of the perceptions of how military SF and the role of the military is looked at. I want to show that the situation is more complicated than before, and that similarly, the impact that it has on its combatants and victims is just as complicated. Warfare has grown to be far more complicated, and the stories it can tell have followed. War Stories: New Military Science Fiction is to be published by Apex Publications in 2014 and is currently being funded on Kickstarter through November 30th. We’d like your help in telling these stories. 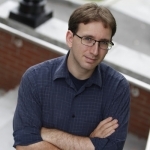 Andrew Liptak is the co-editor of War Stories: New Military Science Fiction. He is the weekend editor for io9, and his writing has appeared in Kirkus Reviews, Tor.com and elsewhere. He lives in Vermont with his wife and son.